Walter Donovan is is the American leader of the Nazi group tasked to find the Holy Grail. Donovan was the main antagonist of The Last Crusade. He drinks water from the false Grail, aging him very rapidly, until his body decays. He attempts to strangle Elsa (who chose the false grail for him) Indy kicks his decaying skeleton into a wall and it shatters to dust. 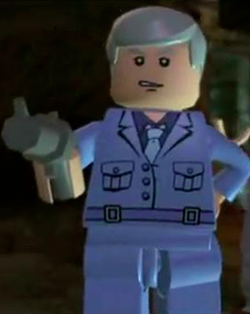 In LEGO Indiana Jones 2: The Adventure Continues, he transforms into a whirlwind after he drinks from the wrong Grail, rather than simply dying. Donovan is the only main antagonist that did not appear in any LEGO Indiana Jones sets. Walter Donovan in his suit.